A swimming pool is a great place for fun, entertainment and relaxation. When done properly, the pool can be a stylish accessory that adds to your home’s beauty and charm, and a big part of what will determine the elegancy of your pool is the paver around it. Whether you’re using stone, concrete or brick, the material you use will impact the theme of not only your pool, but your yard in general. No matter the type of pool paver you choose, you should consider a number of different aspects of both the type of paver as well as the overall plan for your yard. Concrete pool pavers have many features that make them appealing. Their versatility and low cost make them a great option for people with a tight budget or with a bigger pool area to fill. Concrete is also incredibly durable and leaves a lot of room for design flexibility. There are endless possibilities with concrete to make your pool area unique. From light colored pavers to earth tone colors and a whole palette in between, you’re sure to find a color that suits your area’s theme. You can also blend different colors to create a beautiful, unique natural looking pool. However, despite the benefits of concrete pavers, the issue of safety is of great concern. If not well done, concrete pavers can be slippery. The maintenance is also high as you will need to redo a bigger section unlike stone pavers and brick pavers. Stone pavers are the go-to option for those interested in durability, strength and aesthetic appeal. 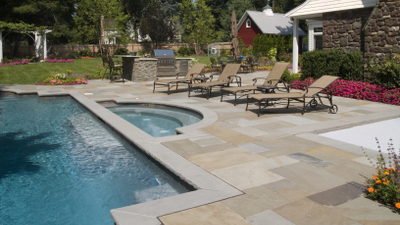 Stone pool pavers are stronger than concrete pavers and can withstand extreme weather conditions and high traffic. Maintenance is also easier with stone as if one stone is cracked, you can remove it and place a new one in its spot, without having to redo the whole pool area. Brick pavers are popular in Northern New Jersey because of their ease of installation and repair, much like stone. Brick also allows for flexibility in colors, and provides both durability and safety. Unlike concrete, brick pavers can conform to any movement in the underlying soil, which prevents pavers from cracking. However, brick are more susceptible to moss and installation could prove tricky if your pool area has a lot of curves. Investing in a great paver is an important part of designing your pool area. From concrete to brick to stone, finding a suitable paver that meets your aesthetic and practical needs is within reach. Whether you want the budget-friendly concrete, the visual appeal of stone or the easy maintenance of brick, all three should be considered before making a decision. Consulting with an experienced landscaping and design firm will greatly help you as you weigh the different types of pavers and which would be ideal for your outdoor living space.